How do you host a pop-up event and what should you know about these unique occurrences? Here are 10 things to think about if you’re considering this fast-growing trend. From retail marketing to experiential dining, pop-up events are gaining in popularity since their inception about a decade ago. But pop-ups are more than just a trendy, “seemingly unplanned” or temporary happening. They have real power in building brand awareness and impressing a new audience. But just as anyone who has ever tried to master the casual look knows, creating an event that goes off flawlessly and yet looks as if it spontaneously happened, takes a lot of coordination. Pop-up events are a powerful combination of expected and unexpected. You have to draw a crowd and yet keep it under wraps until the day of the event. You need to make it appear serendipitous, yet plan as seriously as you would a traditional meeting. If you want to host pop-ups as part of your event business offerings you need to know the following. Offering pop-up events is as broad as saying you plan parties or conferences. There are pop-up dining events (that too is a broad range from underground supper clubs and speakeasies to “impromptu” cooking contests), retail space that converts overnight into a pop-up shop for a special promotion, flash mobs that introduce a moving art gallery, and many other creative uses. Pop-up events can be free entrance to the public, as in a new retail space opening for a few days, or a costly experience, as is usually the case with dining events. Your clients’ goals and products/services they are showcasing will largely affect whether you charge for the events or not. Speaking of charges, it’s important to know that pop-up diners tend to see the experience, novelty, and excitement of the event worthy of a high price tag. They’re not just paying for dinner; they’re paying for the experience, the exclusivity, and the uniqueness of the venue. Pop-up dining is the dinner theater of this millennium and you shouldn’t expect to charge only for the meal. The very idea of a pop-up is born of the unexpected. There is no run-of-the-mill pop-up. The venue, the time, and the secret exclusivity, conjure up excitement. 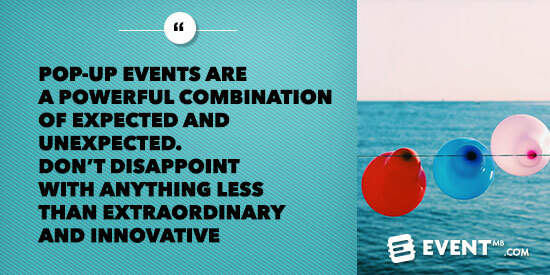 Don’t disappoint with anything less than extraordinary and innovative. Pop-ups are premium events. Just because the pop-up event seems to happen in secret, with the randomness of high intrigue, it is acceptable and suggested to sell tickets ahead of time in the case of a dining experience. Selling tickets to a limited pop-up event also creates a sense of exclusivity. Not everyone can attend. You must have a ticket purchased in advance. There’s a marketing component to all events, but few events are so uniquely positioned to cultivate word-of-mouth marketing, one of the most effective types around. Planning a pop-up takes more of a marketing strategy than other events because of the buzz it creates. You want to ensure it is used in the most effective way. Talk with your client about what his/her marketing goal is for the event. Are they rolling out a new product and trying to create mega fans or are they trying to excite an audience for a future restaurant opening? Knowing the expected outcome will help you create a more effective pop-up. The mistake of a newbie pop-up organizer often involves licensing and the realization one is needed at the last minute. Don’t allow an amazing venue to be ruined by not having the proper licensing. Don’t forget permits and insurance as well. Social Media Largely Powers the Pop-Up. Use It. Some retailer event planners will tell you pop-ups have been used in their industry since 1997. However, it’s only been with the advent of social media, and its ability to create a crowd at short notice, that these events have really started to spread like wildfire. One of the easiest marketing tools you’ll use for marketing your pop-up is social media and other forms of digital marketing. Not only should you use it to market the event but also to keep in contact with past attendees. As mentioned earlier, the potential for word-of-mouth marketing in this sort of event is astronomical. You want to make sure you have some way to harness this after the event, such as a newsletter sign-up or a private Facebook group. Pop-ups are about creating an atmosphere people want to be a part of. It allows them to experience something unique and unexpected; something they can tell their tribe about that makes them feel like a celebrity. For this reason, you can use a pop-up event in nearly any industry that will allow for creativity and has the budget to create a unique experience. Keep in mind, unique is not always costly. The SW Craft Club held a craft-making pop-up event in London last summer to draw attention to itself and encourage people to do more crafting. Many pop-up event organizers have used extras for flash mob participation, and other ways to draw a crowd for their event, by placing an ad for volunteers on Craig’s List. Many unique venues can be obtained for little cost. Pop-ups are exciting events with impressive venues. There’s a lot of work behind each one because the very notion of a pop-up means they can’t be formulaic. While veteran event planners often have hosting events down to a science, creating a formula for a pop-up will dull the mystical aura behind a “surprise” event. In as much as planning is an absolute must, you must also allow each pop-up you host to be flavored by the client and their needs, each as unique as its host and the experience that occurs within its confines.